Ayurveda translates into English as the Science of Life (Ayur - life, veda - science). Considered to be the oldest healing science in the world, this ancient medicine is practiced extensively in Sri Lanka and India. This curative art was passed down from time immemorial through an oral tradition, through old masters to their disciples. Ayurveda is a holistic system of curative and preventive medicine, focusing on the prevention of disease through a deeper connection between the mind and the body. It concentrates on a state of total health based on vigour, energy and balance. The concept of balance is important in Ayurveda - the balance of body, mind and consciousness based on each person's individual constitution. 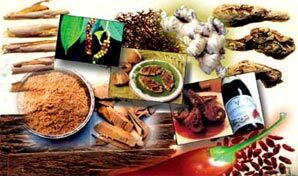 Ayurveda is a health system that has been practiced in Sri Lanka and India for ages. It relies solely on natural medicine. Ayurveda has helped even in cases that seemed hopeless where western medicine has failed. It does not give the patient local treatment of individual organs, but treats him as a whole. Ayurveda is the world’s oldest health care system. Herbal massages, Hydra-therapy, Sauna, Herbal medication, Oil treatment, Yoga and meditation will be part of rejuvenation program that is individually designed after consultation with a Ayuredic specialist. All medicinal oils, tonics etc. are manufactured under ISO 9002 International Quality Standards. The below basic program might be varied after Doctor’s consultation. The Ayurvedic remedies act on the total body, strengthen the power of resistance and promote healing. Ayurveda is conducive to your health, provides you with new vital energy, prevents and corrects the ageing process. An Ayurveda treatment helps combat chronic illnesses and at the same time frees you from psychological burdens. Ayurveda among other things provides swift relief in cases of rheumatic diseases such as arthrosis (signs of over- strain in spine and joints), arthritis, muscle tenseness, restriction of movement, disturbances of the vegetative nervous system such as disturbed sleep, nervousness, exhaustion, tiredness, excitability or irritability, migraine and other forms of headache, heart ailments connected to nervousness, high blood pressure, depression, chronic inflammation such as para nasal sinus inflammation, bronchitis, inflammation of the bladder, susceptibility to colds, skin diseases like eczema, psoriasis, skin allergy, asthma, stomach or intestinal disorders, overweight or nicotine misuse. Ayurveda is recommended to all those seeking inward balance, a long and healthy life and to all those who like to experience the fullness of life.